My mother-in-law makes killer pork chops. There really is no other way of describing them; they are the most delicious, mouthwatering and addictive pork chops I’ve ever tasted. I was surprised when my husband told me he has actually gotten a little tired of them – he said they used to have them for dinner every single Sunday, and “enough is enough”. 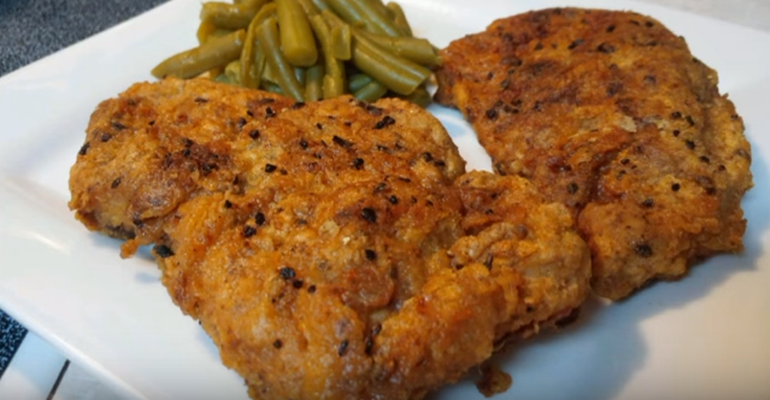 So, even though I think her pork chop recipe is amazing, I had to find a different one if I was ever going to cook pork chops for my own family. And I gotta tell you, these Southern fried pork chops from Patrick Barton are pretty darn awesome, too! If you ask my husband, he will tell you these are the best on the planet. I kind of agree with him… but please don’t tell my mother-in-law I said that! Patrick has come up with the perfect method to create that scrumptious crust. I highly recommend having a look at all of his recipes – there are plenty and they are all delicious! Thanks, Patrick, for sharing them with all of us! Recipe and image courtesy of YouTube and Patrick Barton – check out more of his awesome recipes! Quick Tip: I like to serve these pork chops with mashed potatoes and gravy.